I was sent an unsolicited copy of this book from the publisher. I wasn’t expecting much from this book so I was pleasantly surprised by Haven in a few ways. I really like that this was a fairly unique take on Beauty and the Beast where the guy isn’t the “beast”. I’ve never seen anyone else do that so major props to Mary Linsey. However, this book was slow for the first quarter or so. The first few chapters were a struggle to get through and I didn’t start to like the book until much later on. I couldn’t really connect to the characters and they seemed a little lack luster to me. The writing was pretty good though. I thought the style was nice and very clear. Overall, Haven was good read but not quite my cup of tea. Even though I really liked the original spin on a very over done concept, my inability to fall in love with the characters was the downfall of this book. 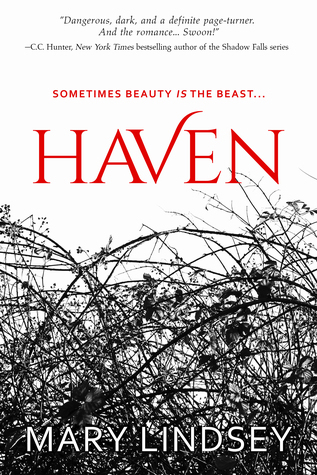 I think if you’re a less critical reader, you’ll enjoy Haven a lot more than I did, especially if you like retellings.